Putting all of Amazon.com's recent moves together points to a shrewd and audacious strategy: competing with the Apple ecosystem. I would not be surprised to see the next generation Kindle launched as something of an iPad competitor; let's call it the kPad for now. Let's look at what Amazon brings to the table to enable the kPad. Designing desirable consumer products, check. Amazon's Kindle e-reader has to be viewed as a home run in this area. Designed by its little known Lab126 subsidiary, it's beautiful to look at, its form follows function perfectly and the user interface is intuitive and powerful. Reviewers sing its praises calling it "ingeniously designed," in The New York Times, "a go-to, standard setting device" on Engadget and "it slays its current competition" in PC World. Although it may fall a bit short of Apple in the area of consumer cachet its estimated sales of eight million units in 2010 is nothing to sneeze at. 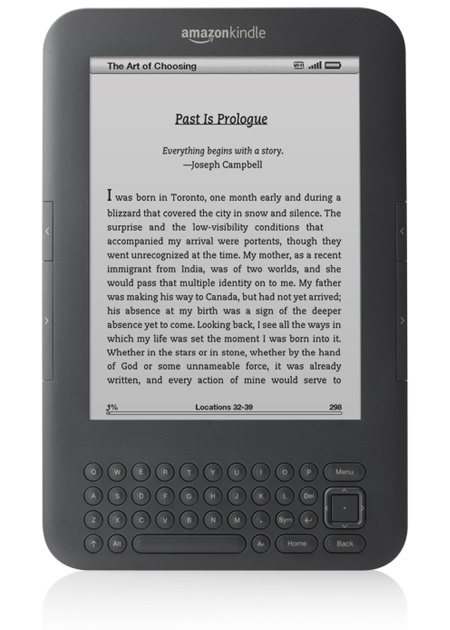 Although they hold sales numbers close to the vest, the fact that the Kindle is the number one bestseller at Amazon tells you that consumers are still snapping up the Kindle. An App Store, check. The recently rolled out Amazon App Store for Android now offers future kPad and all current Android device owners a place to evaluate and download applications. Amazon introduced a very clever "Test Drive" capability which lets you run selected applications on a device emulator prior to buying and downloading. In addition, Amazon looks like it will competitively price applications and use that as a lever to drive market share, the same as they have done for many other products. Apple has just sued Amazon over the "app store" name, but it's likely that Apple also sees this as a threat to their overall ecosystem. Digital Content, check. Amazon is the leading seller of e-books and one of the leading sellers of music downloads. Amazon also has an enormous selection video for downloading, and recently made 5,000 of those titles free to members of its Prime premium service tier. Furthermore, Amazon owns Audible.com which gives it over one million hours of audio programming including books, radio shows and periodicals. Software Capabilities, check. Not only has Amazon designed and built the Amazon.com web platform, an impressive feat of software engineering, they have built several apps for smartphones including the hugely popular Kindle app which runs on the iPhone & iPad, Android, Blackberry and the PC and Mac. Cloud Computing Mastery, check. The March 29th rollout of the Cloud Drive service to securely store music, photos and documents on Amazon's servers was a wake-up call to Apple and Google who have yet to roll out their own on-line music locker. Music purchased through Amazon, as well as user uploaded content, can now be streamed to any device... something that makes the current iTunes system look even more dated. The Cloud Drive is just the tip of the iceberg as Amazon's Web Services unit is one of the leaders in providing the full array of cloud based solutions to customers, ranging from small start-ups to enterprise scale operations. Huge Base of Satisfied Customers, check. Amazon's corporate mission statement is "to be the earth's most customer centric company" and judging from their customer satisfaction index scores that place them ahead of all other internet retailers, they are delivering on their promise. Although I have not seen precise data sizing Amazon's customer base, the fact is that their site is the 16th most popular web destination in the world and the 5th most popular site in the U.S.
Clearly Amazon has the capabilities to roll out a tablet and a compelling ecosystem, but does it have the intent to do so? Jeff Bezos, Amazon's founder and CEO, has repeatedly said that the Kindle is in different product category than the iPad and it doesn't directly compete with it. That is most certainly true, and in fact, many consumers have found the Kindle and iPad to be complementary products. Bezos is an executive not afraid of taking chances and at 47 years old he is still looking to build his company and create his legacy. One clue to development of a kPad is at Lab126 where they have postings for 200 jobs. Some of the jobs like the "Design Initiative Manager" posted on March 14th are intriguing since the role clearly looks like it extends beyond the Kindle franchise: Drive concept investigation projects within the Product Design team; Collaborate with across engineering to establish design architectures, materials requirements and validation criteria to meet new enclosure design objectives; Initiate and support delivery of custom interconnect and key component development to realize new product designs; Develop analytical modeling and validation to stretch boundaries of new product design constraints, enhance new product development quality and speed device development. The role of other posted jobs like the Product Manager position offer additional insight: Combine tactical roadmaps and requirements into a compelling product and evangelize that vision within the organization. The kPad, as I call it, is entirely consistent with Amazon's culture which was distilled to four points by Bezos in a presentation to Zappos.com staff after being acquired: 1) Obsess over customers; 2) Invent; 3) Think long term and 4) It's always day 1. My bet is not only do we see a kPad in the future, but that it brings new ground-breaking capabilities. The Kindle maintains its role as an e-reader while the kPad opens the door for Amazon to compete in the all important tablet market where all the computer hardware growth is expected to occur. Not a bad post, except for the statement about "ground-breaking capabilities". Right now, I think the Nook has it beat by a mile. Providing insight into how business really works. We examine macro trends and delve into the data to reveal the more interesting backstory behind the business news headlines. Profit Perspectives is written by Steven Appenzeller, an independent management consultant, with over twenty years of experience working with some of the worlds leading financial services and information technology firms. When Should You Collaborate and When Should You Compete?